Do you struggle with knowing what you should and shouldn’t take on your holidays? What if you need something, what if you forget something? Surely it could be easier? 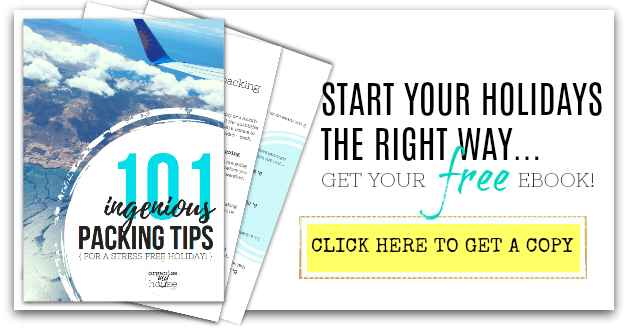 Today I wanted to look at your summer holiday checklist – exactly what to add to your packing list and why – in the hope that you can create your very own packing list and be safe in the knowledge everything has been thought of. and… as a special bonus – I’ve included a free printable for you – hope this helps! It can be so hard knowing what to pack when you go away – whether just packing for you or for the entire family – the onus is on you to make sure you pack as lightly as possible while still having everything for every eventuality. I’m feeling a little stressed just thinking about it! These questions are vital in knowing what to pack. Think about it – if you are travelling in your car you can pack a LOT more than if you are flying, where there are weight restrictions. If you are travelling with another family there will be things that you can split so you can share while away and not have to pack everything. If the weather is absolutely guaranteed to be hot then it’s a complete waste of time to pack a jumper – and if you are going away for a weekend, then the amount of clothes you take will be far less than if you’re away for a fortnight. So – once you know the information about your holiday, you can start to create a packing list. BUT – WHAT SHALL I TAKE? I’ve created a summer holiday checklist for you that you can download which should help give you loads of ideas of what you need to pack for your own holiday – but I’ve also listed them all here with some extra advice along the way – hope they get you thinking! If you want to use a pre-made packing list that’s categorised ready for you to add your own items to it – then you may want to take a look at the Holiday Planner I have available. Everything you could possibly need for planning your holiday this year. TIP – Think about having a main colour for all your clothes so that you can mix and match everything. This means more choice with less items when you’re away. TIP – These are purely areas to think about rather than exact items, as your needs will change depending on what the answers to the previous questions are, and also what you like wearing! #8 – Travel wear – what you will travel in (think about wearing your heavier clothes if flying so you don’t take up too much of the weight allowance). TIP – Think about what you will need to have with you when you travel (if flying) – medication would be critical to carry just in case your bag doesn’t make it with you…. TIP – If going for a shorter time, consider dispensing shampoo etc.. into smaller travel sized containers so you aren’t taking too much (or buying travel sized) – and pack in a plastic bag in case of spillages. Halfway through! – hopefully you’ve already got some inspiration for your summer holiday checklist – but to finish things off (and to get the free printable checklist) then just CLICK HERE…. Previous Post: « IS MY HOUSE CLEAN ENOUGH? – GIVE YOURSELF A BREAK! Thanks for this post, useful to compare to my own holiday lists. My only additions to this list are ear plugs (I’m a light sleeper so always find these useful – I’ve just seen you have this on your 101 list! ), shopping bags (finally most of Australia now requires you to take your own to the supermarket, else you have to pay extra), and refillable water bottles for all. The other holiday lists I also have are lists of foods & drinks to pack for self-drive holidays, meal options with a shopping list for destinations we fly to, and a list of snacks to take with us. My tip is if travelling with the family for a week or two wait until you get to the resort to buy larger bottles of shampoo etc . If in Europe there are plenty of supermarkets with a lot of choice . One essential thing we’ve learned (as glasses wearers!) is take a spare pair of prescription specs – as losing or breaking your only pair when away is incredibly expensive, really messes up your activities, and sorting it out eats into your precious holiday time! So I take a spare pair, and also keep with them a pair of cheap clip-on sunglasses so I’m also covered if I lose my prescription sunglasses (not the most glam looking but hey we’re on holiday). I also always take a small torch and keep it in on the bedside table in case it’s ever needed (so in the event of a power cut or fire alarm or whatever, I can save battery by not using the torch in my phone).